Hello Sweeties! As usual it's the year end sales....NO!!! It's the Massive Giveaway time again. This year I'm your Santa! Whether you are celebrating your Christmas night with your friends or family, there are always a gift or wishes from me. 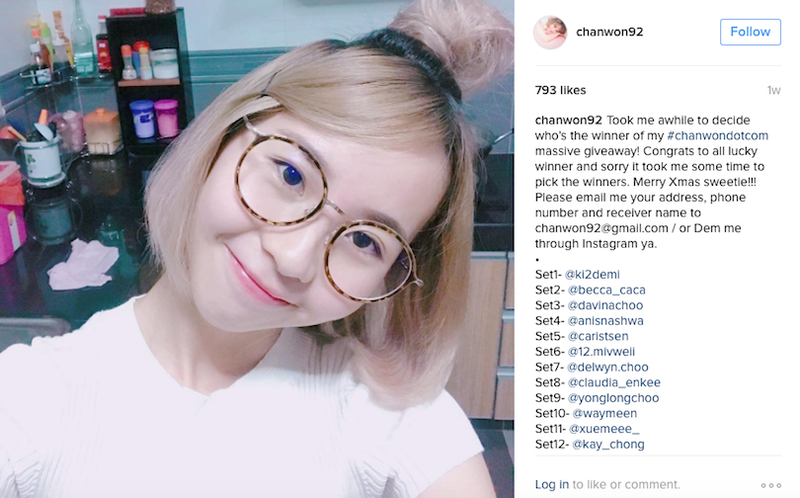 So this time in order to celebrate my 60k followers on my instagram account @chanwon92 I will be having a huge giveaway to all of my readers and followers. It's been awhile since the previous giveaway and most of the items I actually purchase it myself during my trip & some of the product was actually received and sponsored from brands I love / collaborated previously. (1) Just comment on this blog post below who are you because I want to know you better and just some random things that you wish to share with me. Share the same comment as your instagram caption. Yes, that's all. 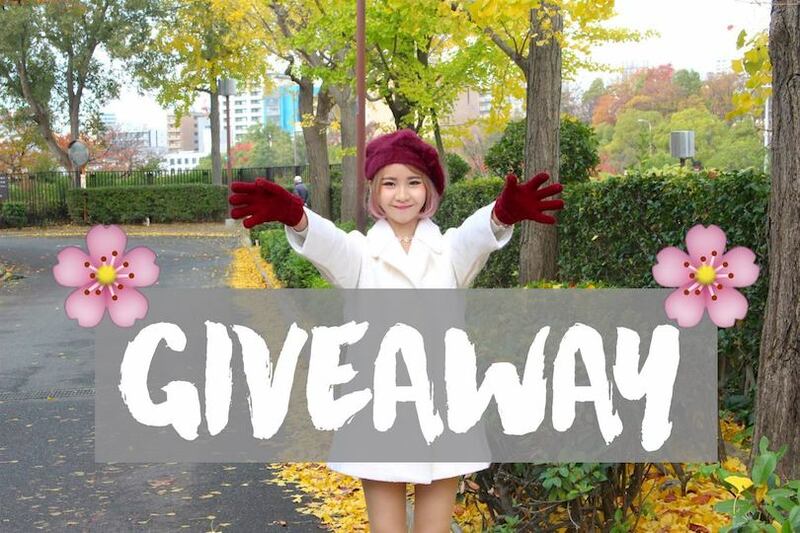 That is all about the giveaway content and giveaway winner will be announce on 20/12/2016 @11pm. Will announce it on my instagram and updating it on this blog post too. I hope to give something back to you guys for supporting me since years ago but I have only 12 sets for this. Hope you can win something back for yourself and I will deliver it right before the coming Christmas. So here's the massive giveaway set from set #1 - #12. For hair lover. Here's some of the hair product and the 6 in 1 multi-styler from Philips. For beauty lover. Cleanser , mask , exfoliating glove , bubble net for body and lotion. Victoria's secret set for you guys! It's a 5 in 1 set fragrance mist. So if you love to get this then join this contest to win it home. As usual the previous giveaway I did prepare a set for stationery lover. This is another set which is one of my favourite set too. A black cat diary that I bought during my trip and i keep this for you guys! It's the 2017 diary version. I choose this because the cover really 'tahan-lama' and won get dirty easily. Also included some stickers, colouring book that I ordered for you guys and the drawing was super duper cute. Another set for beauty + makeup lover. You can win a new airy cover fit compact foundation , eyeshadows + mascara from Canmake , the Kose Sekkisui famous cleanser that I bought for you guys (in Japan), and last but not least the water based makeup remover that I wish to let you try! This is more to skincare set. Cleanser , makeup remover , Anmyna mask sheet and the famous peeling solution that I got for you from Korea too. For people who are really love outdoor activities I prepared this for you! A dreamy multi-ways bag that you can wear it as a sling bag / backpack , a cute sunglasses that I bought in Japan, the tweezers for you (if you running out of time wanna quick removing your armpit hair or upper lips hair then this is a must). Last but not least, a fragrance mist from bath & body works. This is also one of the most adorable Iphone6 casing that i bought in Japan. Brand new never use before and I keep this for quite awhile now and finally is time to giveaway for someone else that love melody too. It's the original authentic sanrio case that I bought in Japan. It cost around RM90+ because it's from Sanrio and Japan only selling authentic and original phone case that why it's worth for the price. Plus, a lip color for you to look more chio + the too cool for school squeeze blusher for you + some chokers. I bought the blusher from Korea , the innisfree cushion casing which melted my heart and I believe you guys might love it too. So here's the time for you to win it home! The bonia hand accessories that I picked for you guys plus some of the choker that I bought for you too. The famous orchid range product from Innisfree! No need to talk more about this because everyone love it!! Innisfree my cushion casing set for you guys! A total of 6 cases for you to change based on your daily mood. Lastly, another set of cushion case that suit the xmas theme! This is my favourite design ever and wanted to win this home? Join the contest now!! That's all for today. Love, xoxo. Hi Chanwon! 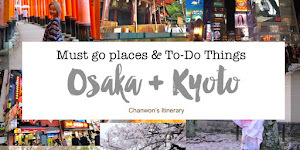 I am Chiow Ling here~By reading your blog posts, I have learnt on how I should style for my OOTD and also understand more on Japanese culture and tourist spots. Really love all your blog posts and also vlogs. Wish you all the best in everything you do and will support you always ❤❤ Lastly,I wish you to get Set 10 for the giveaway as I can give them to my mum as HER Xmas pressie. Hello! I'm Eric. My girlfriend and I have learnt a lot about Japan trip by reading your blog posts. The travelling tips you gave are very helpful for us as we are heading to Osaka next year. Reading your blog posts while planning our itinerary is delightful. Lastly, I wish to have Set 5 for the giveaway so that I can gift it to my girlfriend as a lovely surprise! Thank you very much and Merry Christmas! Hi Chanwon! I'm Beatrice (a.k.a Beat - Rice) from KL. I've been your follower since way back 4 years ago till now. Your post, photos and words inspired me and widen my lenses to the world, especially Japan culture! Everything about you is in the themed of sweet, pink, soft, tender; which "soften" my heart and my "dark" world! For this giveaways session, I would like to take up the #Set 10 as I'm constantly looking for a great set of skin care range and that's the set I love!! Hope that I can be one of the lucky winner for this memorable X'mas year! Hi Chanwon! I'm Michelle and I'm actually one of your junior from MMU! I got to know you from the word of mouth from friends around saying there's a famous, young and successful blogger from MMU! I was kinda curious and at the same time admire what made you to be such great and well-known at that time. I don't usually follow any bloggers or social media influencer from Malaysia, but I'm glad to say that you're the only blogger who caught my eye! By following your Instagram and reading your blog till today, I personally feel that you're one of the type which are very down to earth, natural and committed blogger which made me feel comfortable and look up to! You've inspired me to work hard and achieve my dreams to travel to places I dream of in future, especially Japan! I like how detailed and kind of you to share your travel itineraries and experiences for us readers who needed it very much! Hi Chanwon, it's me Way Meen, hah I think you quite familiar with me already :D I remember last year I did joined this kind of giveaway but I'm not lucky enough to get the gift, and then I received another gift from you, super touched TT And you know I follow your blog since secondary school until now, from short hair to long hair, and yayy I'm still using the hair band that you gave me <3 For me, you're not only blogger, you're my friend! We shall meet one day heh :) The way you interact with us is really true from your heart and I feel that there is no distance between all of us! In 2016 Christmas, I wish to get Set #10 because orchid range is anti-aging set, hmmm perhaps I shall start to use this kind of skincare from now. Wish you have a happy Christmas day in advance! The gift that i wish to get is the set1, which consist of hair products and most importantly the 6 in 1 hair styler from Philips..OMG i just cant believe my eyes when i saw that the 1st set is that..i just went around aeon to check it out and was thinking whether should i get it or not as a gift for myself and poofff...i saw u posted it.. I really hope i am able to get it..
Hello Chanwon. I'm Jessie Wong. This's my first time joining giveaway contest. I wish to get the gift from you as I always think that it is impossible to win and get any gift from the giveaway contest. So that I hope I can win the gift from you! Thanks!! Wish to win set #6, as I'm a mask lover :D Thank you! Merry Christmas! Hi Chanwon,I'm Pei Wen!This is my first time to join a giveaway,and I feel really excited!I really like your outfits and I love to see your Instagram!Especially the photos that you post it when you're travelling😘 I'm a fragrance lover,especially for Victoria Secret!So yah,I love set#3 so much!I'll be super duper happy if I received this gift!Enjoy your day Chanwon! I prefer giveaway set #1 . Hello Chanwon. My name is Amanda Lee, and i love to scroll and enjoy all your instagram stories and snapchat. I'm ypur snapchat friend too.Username:aman.1020. Your designs are also so so so pretty. You dress up with pastel colors and i'm in love with pastel colors too. I love innisfree products very much and love using them. I love to read your instagram feed when you travel especially to Japan. You also taught me how to curl my hair through your youtube video. I really hope i can win this giveway. I'm a super fan of you. I hope to hear from you! Hye Chanwon! This is Jojo here! I have been following your Ig for years and I would love to say that I love the way you sharing your own life tips to all your readers. I have learnt lots of small tips from your Ig posts and your blog posts. I admire you so much. You are such a successful blogger I know. Btw, I really wish and hope to have #Set6 as Christmas present from you. Konichiwa Chanwon! :) I'm Wei Qing, the short girl who love explore cafe shop when leisure time and super duper love traveling! I'm wish one day I've my own little cafe shop at somewhere else. The reason why I'm love explore cafe shop it's because the interior design are attraction not the coffee! Hehehehe. I'm love travel,skincare and camera blog that you post! It's informative for me. You post every single thing very detail and tell us where must went through when at Japan! Actually I'm envy at you, you can travel non stop in a year. Especially Japan! Aww, the place I wish to step to. I just wish I can do that same as you as well in one day. Wish one day can meet you and selfie with you! I like the way you editing all the picture and your wearing outfit too..
Hello sweety, i am Doreabao from Seremban, hidden street blogger,lol. Love your are so truth, not acting, the real u! U deliver positive energy everyday. I am much older than u, but I am willing to learn from 90x,brave to express who u are,plan and do what u wish, and get actively to live everyday! I wish I could get set 6,knew u are Anmyma lover but I never try before. Thanks for sharing anyway! Hey @chanwon92 , I'm Guy Sin Ying here! (Some of my frens called me 'ah guy', but I'm a girl with long frizzy hair..get it? Haha. Can you guess what's my surname in Chinese? XD I I really love trying different styles during an outing, especially now that I need to wear uniform to work, #ootd is a must, just like you! There are so many in trend clothings out there but there are more which are sleeveless. Armpit hair is the only thing that bothers me everytime I open my wardrobe (ok this is gross :3), so I'll go for sleeved shirt or dress instead. Haha. Thus, I'm in need of set 7 to get rid of this problem.I'm also love dessert and have always wanted to try the baked cheese tart of Pablo. Yummss..
ps. All your japan travelling posts and japan haul posts are awesome! Hi Chan Won, this is Ka Wei here. I first noticed you back when you started doing OOTD for Shoplooh, I really loved your style and thus decided to find out more about you! I enjoy reading your blog posts as well as scrolling through your instagram, those pictures are just too pretty for my eyes. I would love to win Set 5 as I totally wanna tryout those Japanese makeup that you had been talking about. Merry Christmas and have a wonderful 2017!!! This is not my first time to join giveaway organised from you. I have remembered I have won #hellokittygoaround ticket from you. My sister & I are hellokitty lover. It's a pretty good chance & luck for us to visit there. I have been following you for few years, from blog to instagram. You have shared many useful information to the public and also inspire many people. Keep it on and become better. Hello chanwon ! I am xuemee ! to tell you the truth, i followed you because we almost share the same interest. I love pastel colours and cute cute stuffs. Everytime i see them I couldnt resist getting them! I also get inspirations of ootds from you because your style definitely suits mine! The places you travel such as Japan is my dream place too! I like exploring new places just for food, i really love food haha. I spend most of my time watching korean dramas too! My favourite one now is Goblin hehe this is too random. Anyways, just seeing you having giveaways, proves that you are really generous and its really hard to find people like you in this society nowadays �� More ? I like joining giveaways too ! �� Thank you for reading this ! I have waist length hair, I love everything about fashion👗👠👜,make up💄💋! I'm a food lover🍜🌭🍰.. hmmm consider myself a shopaholic too because I love shopping🛍💸,it helps me relive stress and let me feel so good😍! When I first saw your post .. I stop blinking my eyes 👀because your post is so interesting, I feel want to knows more about you ! Then I found out Chanwon has good sense of styles, you great in mix & max outfits , all OOTDChanwon Is just look so good 👍! You recommend mouth-watering food🍪🍩, provide make up tips and useful travel information!! I found all the things I want here❤️ !!! Seriously, I really enjoy reading every post of you,so please update your social media often📲💻because I just can't wait to read your new post ! This is Sin Yee aka Princess Neverland. I work as a chemical engineer but that doesn't mean that I'm a boring and dull person! Just like any other girl, I love dolling up myself, setting up nice hairstyle and putting on pretty make up. I enjoy your Instagram feed because I'm into sweet and cute make up and your make up is always my inspiration! Due to my occupation nature, I don't get to wear pretty clothes and put on make up every day so browsing through your pretty photos serves as my 精神粮食hahaha >< My work is quite tough that I have to OT very frequently. Whenever I have to OT at the office, I will read your blog while having my dinner, 一边看一边配饭吃haha! Thank you so much for creating awesome contents for all you readers! I hope to win set #10 because I can feel that my skin aged a lot in these few years, probably because I always work under the scorching sun. Really wish that I can get the Innisfree skin care set so I can give my skin a good pamper! Nice to meet you, chanwon. I am Samantha who will never get rid of myself to read all your posts whether in instagram or facebook because they really motivate me a lot. I remembered you have shared with your followers once in a post which indicated that you really work very hard to achieve your travelling dream. Your experience taught me a lot and I realized that nothing comes easy but I have to work extremely hard to get my hard work paid off. I was in a similar situation like you before in my college life. I wish to travel to many countries especially Korea and Japan but I couldn't afford to do so because I still have to bear with my college fees which burden me so much. Travelling will only be appear in my dream. However, I am officially graduated and I had got my very first job which could provide me an opportunity to travel as long as I work harder and achieve my target. 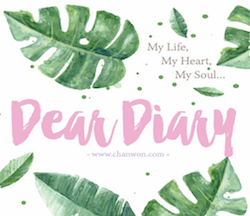 I would say million thanks to you, chanwon who was a friendly blogger because you are willing to share own experience to motivate your followers like me. I understand that nothing is impossible and you can just do it in the way you are. Besides discovering your travelling experience, you also inspire me a lot in the way you style up yourself. You never disappointing your readers with every single outfit you wore. Your ootd always impress me in a different way let me believe that my willingness to match and mix with every single pieces of clothes that I have, I could be "chio" in my own way too like you did. I hope I could win myself set 5 in this Christmas giveaway because I am in need of beauty products to enhance my confidence in my appearance. Although previously I am not a lucky pick in any giveaway but I never give up because I believe my strong determination to win can turn me into a lucky winner in big giveaway in advance. Hi Chanwon! I'm Hanis. I followed you since I found your post on Japan trip. I was planning to visit my brother who is currently studying in Japan :D Oh, I love how you edit your Instagram feeds and thank you for the tips ! And I have a hug crush on your hairstyle <3 I would love to win #Set4 because I am currently into planner things and a stationery addict too. Check out how I deco my planner at @shuaplans. I'm @Anisnashwa on instagram :) Wish you the best in life and stay kawaii! Hi Chanwon dear, I'm Kimi~ ❤ It's been a while since I've started following you. I like your cute and bubbly personality and the way you present yourself (outfit & makeup too)����. You're very professional and responsibile when it comes to work, eg. You would focus on your work immediately although you just landed from traveling ✈. You were so tired yet you still put up a smile and start your day, that's a point that inspires me. �� You also earn your own money and travel to different countries, it's really amazing! Love your posts on tips for budget traveling ��. 3) Every time I go Starbucks or make a reservation at restaurants, they NEVER get my name right. It's either Jimmy,Kimmy,Tim, ...and they assume that Kimi is a boy's name �� Mr.Kimi. Be the person that builds someone up. My favourite posts are those Japan related post! <3 I too love Japan very much and feel so happy that I get to see more of Japan through you. I hope you will continue to post many more Japan posts for us Japan lovers. I would love to have set #2 because I love beauty products and the pinkish design of Anmyna products is so beautiful! Thanks for being so generous and Merry Christmas Chanwon! Hi Chanwon this is Choon Lim. I know you from my girlfriend because she always shows me your photos and asks me to help her take similar photos like yours haha. She always says "帮我拍这样的，腿要瘦瘦的" while showing your instagram photos to me. I'm very noob with camera and I don't know how to take good angle while shooting. I started to follow your Instagram so that I can learn more about photoshooting and produce some similar sweet and cute photos for my gf. Apparently my photoshooting skills did improve because my gf is very happy with the photos I took for her (less complaints now hehe) Christmas is approaching and I'm thinking to give my gf a surprise. I know she likes Victoria's Secret fragrances because she always goes check them out from the store. However, she always 不舍得 to buy so when I saw VS fragrances from your giveaway, I decided to join it and win the gifts for her! She will be very happy to receive such a sweet gift from you on Christmas. I would like to win set #3 and wish me luck. Thanks Chanwon for the generous giveway. Hi, I'm May. Throughout these few years, I have came across your blog when I was searching for product or service reviews ��. You seem to have tried most things I googled for, keep up the good work! There are so many exciting gifts so it is difficult to pick one. Since I am addicted to perfumes no, I will choose set #3. Hii Chanwon! I'm Jia Qi, 19. I am a broke af college student, a foodie, a photography enthusiast and an amateur blogger. An overview of me goes like this: unorganized and messy. Every year, I always set a new goal for a new year. I tend to write down my goals and how I would allocate my time, but everytime my plans failed to live up to my expectation. Also, I'm very forgetful (people who know me well will know that this is one of my biggest flaw) I use notepads and sticky notes to remind me constantly but I just tend to forget. Therefore, I really want to win set #4 because I really really wish to get everything organized and get a life! The black cover is also a plus as I carry my notebook everywhere because it is so convenient when I wanted to jot down anything important or mark important dates. Also, I am a hoarder of pretty little things. I really love the smaller-sized papers because I can use them to write down creative ideas for my upcoming blog posts and use them to spice up my hostel's mundane table space as well. They would be really cool inspirations for me to develope my creativity and innovation. Last but not least, I want to win set #4 for my brother who is still in primary school because he loves the colouring book a lot whenever he sees them in Popular. I also hope that by winning the colouring book for him, his mind would be able to focus better. I just want to surprise him with pressies during this coming Christmas because I never get him any Christmas presents before as my family don't celebrate Christmas. But I figured this would be a really good opportunity to show him some love. I really hope I could surprise him with some of the goodies in set #4. This is my friend account.